You could WIN THIS KAYAK ! Back in January 2011, Atlantis Kayaks decided to build and donate a custom kevlar Atlantis Titan VI with two-tone fade and clearcoat hull to be given as the grand prize draw for Coast&Kayak (Wavelength) magazine’s 20th anniversary. Our First Annual Adventurers’ Getaway was a total success. 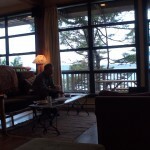 The lodge is located right on some of Canada’s finest real estate overlooking the vast Pacific Ocean. With 2 beaches and 40 acres of privacy, Middle Beach Lodge is the perfect setting for both the adventurer at heart as well as just curling up to read a book in front of the central fireplace. From the comfort of the Great Room, some of us sipped coffee and watched while others were tempting the cold waters of the pacific. Friday had a few who managed to paddle the surge created from the tsunami that devastated Japan the night before, a sombre reminder that Mother Nature is a force to be respected. A good night’s rest saw the group of us paddling in the protected waters off Grice Bay due to southwest wind warnings. After a gourmet dinner prepared by some of Tofino’s finest chefs, we all gathered in the great room to attend Colin Angus’ private Saturday evening presentation on his award winning adventure film ‘Amazon From Source to Sea’. With the sound of crashing waves in the background, Colin captivated us with a personal narration of his five month excursion down the world’s most dangerous river. The weekend finished off with a day of playing with long boats in the surf zone. This was our first event at Middle Beach Lodge, but it certainly won’t be our last. While it’s going to be hard to top this, next year’s event is shaping up to be as inspiring. Here are a couple of photos from the weekend. Colin Angus paddling the Atlantis WaV through dumping surf. James Cowan backsurfing the Spartan VI. James Cowan punching through dumping surf in the Atlantis Spartan VI. 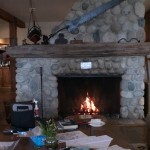 A short video from our Quadra Island getaway weekend held Nov 14, 2010. This could really catch on. 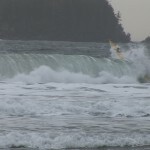 Footage from our Quadra Island Getaway Weekend on Nov 14, 2010. Get ready for your next summer adventure by getting your Paddle Canada Sea Kayak Skills Level 2 Certification throughout the winter. 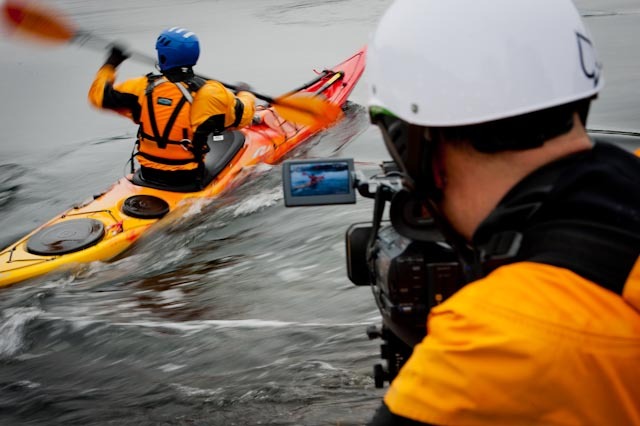 Paddle Canada Sea Kayak Skills Level 2 Certification customized courses are offered to cater to your organizational, professional or personal needs. Course schedule can be adapted to suit your availability, and additional components or themes can be incorporated into a course to cater to your requirements. This course is specially design to fit your schedule and allowing enough time for you to develop the necessary skills to obtain the certification. This is not the typical 4 to 5 consecutive day course, but working by section, 1, 2, 3+ hours at the time or according to your own schedule. 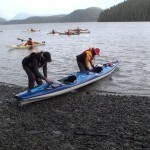 It is up to you decide how long you want to take to get the Paddle Canada sea kayak skills level 2 certification. Note – This course requires 1 overnight camping. Colin Angus well on his way to breaking record. 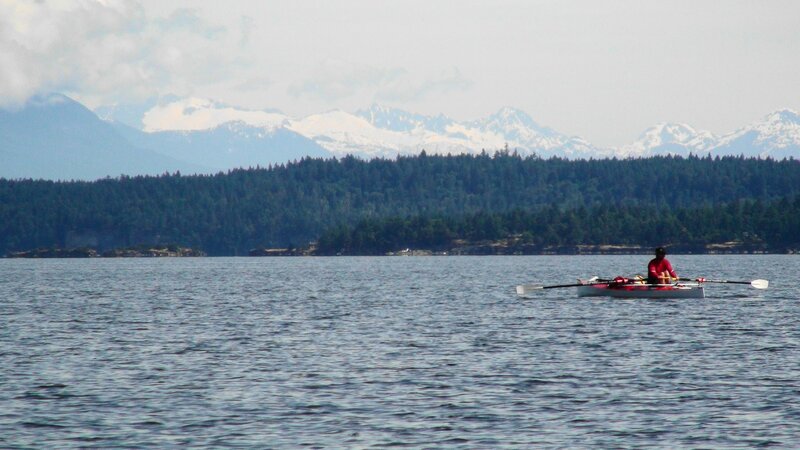 Colin Angus rowing into Dodds Narrows during his epic circumnavigation of Vancouver Island. Colin Angus rows through Dodd Narrows. Colin is expected to complete his adventure sometime tomorrow between 5PM and 7PM PDT at the Pt. Holmes boat ramp on Lazo Road in Comox, B.C. Anyone interested in watching Colin set a new speed record for travelling around Vancouver Island by human power is urged to come out and cheer him on. For those of you who have asked me about kayak lessons and training, here is the info you’ve been waiting for. I can personally vouch for the level of expertise and professionalism these folks have. Here is the link to the course schedules GoKayak.ca . Or you can reach Yves at info@gokayak.ca. By phone at (250) 477-9881. On September 4th, 2010 at 8:22PM, Joe O’Blenis successfully set the new world record for circumnavigating Vancouver Island by kayak with an official time of 16 days, 12 hours and 14 minutes. 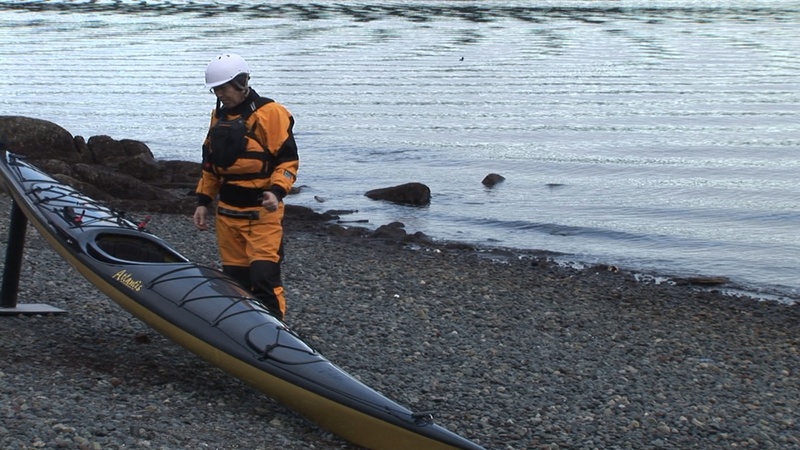 All of us here at Atlantis Kayaks would like to congratulate Joe on his inspiring adventure. Having Joe attend our 1st Annual Corn Roast on Newcastle Island was icing on the cake. A big thanks to everyone who turned out and showed support. We realize this is short notice and a long weekend to boot, we would like to invite you to the 1st Annual Atlantis Kayaks Corn Roast Dinner on New Castle Island which will be held on Saturday September 4th. We came up with this grand idea that we could set this date in hopes that we could also cheer Joe O’Blenis in upon his hopeful record breaking return to Nanaimo . 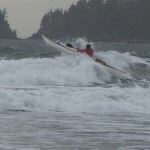 Joe started his solo paddle around Vancouver Island on Aug 19th at 8:08 AM from Brechin boat launch in Nanaimo . He is trying to beat Seam Morley’s record of 17 days, 4 hours and 49 minutes and reclaim his title to circumnavigate this beautiful Island . Now, even if Joe does not return on this date, we can still enjoy what Newcastle Island has to offer along with some food and fun. Some are planning a race around Newcastle Island , however, you could explore the many trails around Newcastle or simply relax on the grounds taking in the views from Newcastle and make a weekend of it. Newcastle Island does still have camping sites available. Please view link for Newcastle for more info. www.newcastleisland.ca If some of you are in need of a kayak or gear let us know and we will see what we can arrange for you. Travel options to get to Newcastle Island are to paddle or boat across from Nanaimo (Brechin boat launch) or to take the passenger ferry from Nanaimo water front at Swy-a-Lana Lagoon. Info on ferry is also on Newcastle website. The dinner will start at 5:30 PM and will be held at shelter 2 & 3 (reserved for this event). If you are interested in joining in on our Corn Roast Dinner the fee will be $10/person and $5/child. Camping fees will be covered by Atlantis Kayaks. We will be serving CORN (as much as you can eat or when we run out), chicken salad, buns, veggies & dip, and for dessert – cookies & squares. Some beverages will be provided such as water, juice, coffee, and tea. Please RSVP by Thursday Sept 2nd as we will need to know how much food to prepare and bring. We hope you can join in and together we can make this a fun filled day and hopefully celebrated return for Joe.